Bliss balls are an excellent choice for your afternoon pick-me-up or post workout snack. The moreish snack is full of protein, fibre, vitamins and minerals and are a good way of incorporating seeds into your diet. They’re gluten free, dairy free and free from refined sugar too! 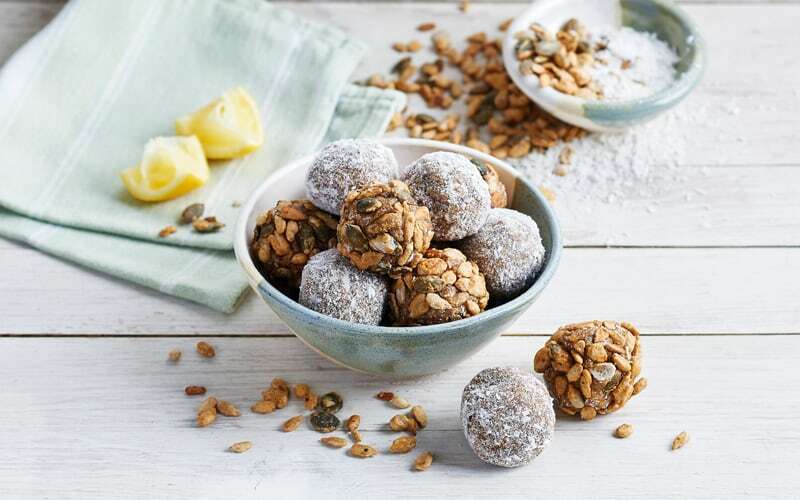 Bliss balls are perfect for any snacking occasion and will satisfy any sweet tooth. They’re great for packing up in your lunchbox, gym bag or picnic basket to help keep your energy levels up and leave you feeling fuller. Soak the dates in boiling water for 10 minutes, drain and put in a blender with all of the ingredients apart from the coconut. Blend until well combined but not totally smooth. Stir in the desiccated coconut, roll into balls; coat half of the balls by rolling them in the seeds. Freeze for 30 minutes to ﬁrm up.